Works on display in Think Small 7 represent an impressive variety of media and themes. No piece can be larger than 3 inches (7.62 cm) in any dimension. An evolving list of participating artists, including yours truly, can be found at artspacegallery.org/thinksmall. I present to you the smallest painting I have ever made: A three-inch by 2.5-inch (7.62 cm x 6.35 cm) miniature artwork for the upcoming Think Small 6 miniature art show, held at Artspace in Richmond, Virginia. Titled Deconstructed Mash-Up in Improvised Colors, this new miniature artwork reflects my recent experiments in abstract and randomized compositions. 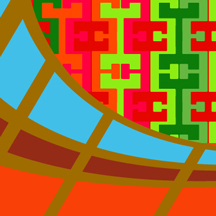 I landed upon the composition on accident, while designing something very different on my computer. When it came time to make this painting for Think Small 6 — I was working under a deadline — I kept changing the colors as I went. In essence, this painting is a study; I am considering an attempt at a larger version, using different colors, soon. Think Small 6 is an international miniature artwork invitational, bringing together pieces by 260 artists from around the world. The show will open at Artspace on Friday, October 28. A preview gala will be held on October 27. I have priced this painting, which is signed and framed, at the low-low price of $59.99. 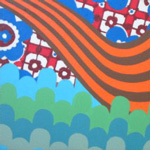 If you are interested in acquiring it for your collection, please contact Artspace at thinksmallart@gmail.com. 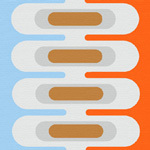 This fall 2011, I will have a lively exhibition calendar: three art shows in three different regions of the U.S. The Vormance Expedition, which I will be exhibiting at Louisiana State University’s Student Union Art Gallery, starting October 23. 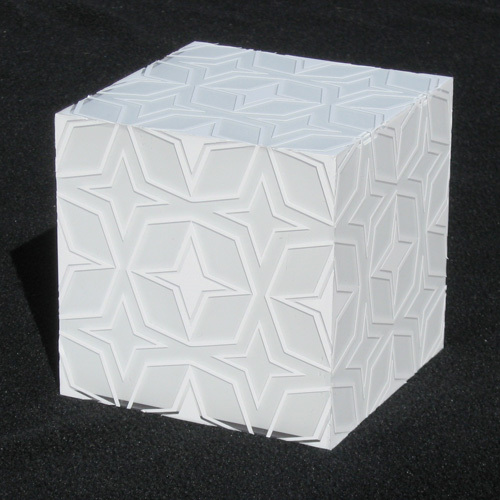 2011 20”x20”x20”: A National Compact Competition and Exhibit. The LSU Student Union Art Gallery at Louisiana State University, Baton Rouge. On view October 23 – November 30. In this an all-media competition, which is open to professional artists residing in the United States, works cannot exceed 20 inches for any one dimension. Juror Julie Sasse, chief curator of contemporary art at Tucson Museum of Art, selected 49 works by 46 artists. I will be exhibiting The Vormance Expedition, a painting I produced in 2010. Chaos Theory 12 at Legend City Studios, 521 W. Van Buren Street in downtown Phoenix, Arizona. See Google map. On view October 7 – late November; opening party from 6pm until “?? ?” on October 7. 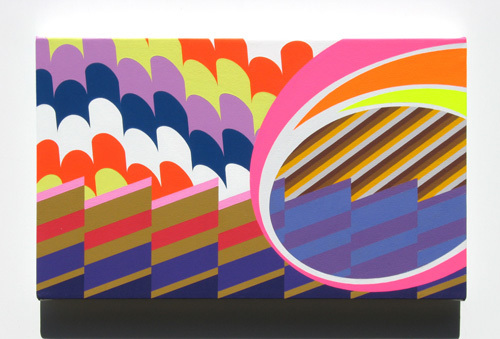 Organized by artist Randy Slack, the annual Chaos Theory invitational brings together dozens of highly talented Phoenix artists. The exhibition has been described as an “unofficial barometer of the art scene.” Although so many visions are represented in this show, the works all seem to harmonize magically. This will be my third Chaos Theory; view photos of the 2010 show. It is always a great honor to be invited to participate in Chaos Theory. Think Small 6 International Miniature Art Biennial at Artspace Gallery, Richmond, Virginia. On view October 28 – December 18. This will be my fourth time participating in the invitational miniatures exhibition, which challenges artists to produce work that does not exceed three inches in any dimension. 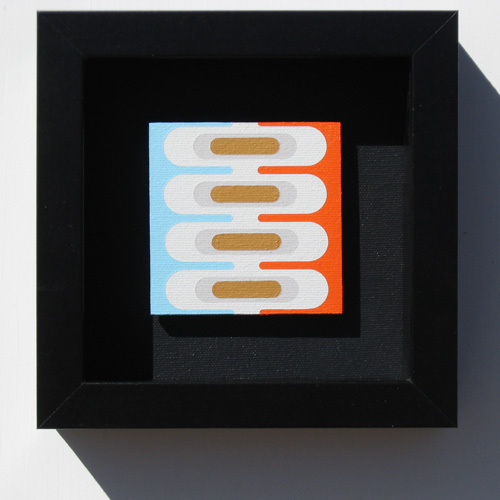 See the three miniature paintings I produced for Think Small in 2005, 2007 and 2009. 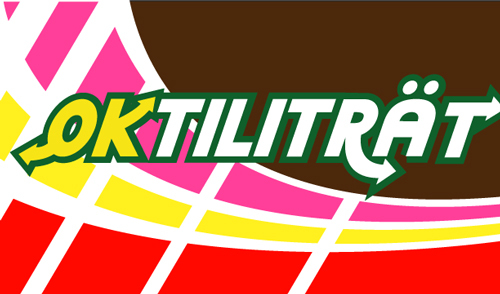 I have not yet produced a piece for the upcoming ThinkSmall6, but I will certainly be working on something very soon. … And you’ll be the first to see it here on my blog! As a friend of mine says, “Anything worth doing is worth not doing for money.” And I completely agree: If love to do something, you don’t care about the stuff that happens after you do it — the happy byproducts, such as sales or awards. The work, itself, is what matters. The work is its own reward. Three miniature paintings: I have exhibited in Think Small series of miniature art shows in 2005, 2007 and 2009. Above are Tgxgncvkqp 34, Omnicron’s Dilemma, and Telomir 9. Each miniature painting measures 3 inches square. The above calculus deliberately excludes the cost of transportation to the shop where I bought the frame, as well as overhead. Were I calculating net profit, there wouldn’t be a profit, I am sure. I also began to consider how much time was invested into making the work. I actually had to make the painting twice, because I wasn’t happy with the first iteration. All told, I believe I devoted five hours to the process of making, and maybe one hour to fitting the painting into the frame, packing and shipping. That means six hours, or 41 cents per hour. What does all of this mean? I don’t know, frankly. And I really don’t care, either. If I were to make paintings purely with profitability in mind, perhaps I’d frustrate myself horribly — even though it does sound tantalizing to produce a glossy, Fortune 500-style annual report, detailing all art-related financial activity for my collectors and interested parties! Contrast this experience to news about the new wave of art auctioned at Christie’s and Sotheby’s this week. The latter auction raked in $181 million on Wednesday; Kees van Dongen’s 1910 Jeune Arabe, alone, was claimed for a record $13.8 million U.S.
All I need to do, now, is sell 15,000 paintings, just like this, every year. Then I’d be in business! Telomir 9: Exhibiting in miniature art show Think Small 5. For the third time, I will be participating in miniature art show ThinkSmall, held every other year in Richmond. This year will be the fifth ThinkSmall miniature art show; the first was held in 2001. 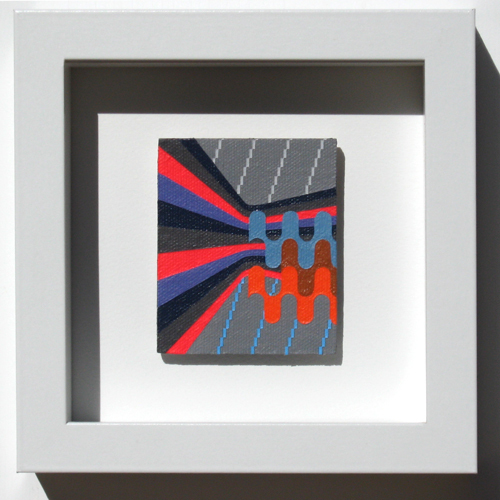 This time around, I will be exhibiting Telomir 9, which measures 3 inches square, and is acrylic on canvas, mounted on panel. No work of art in the show may exceed 3 inches in any dimension. See a list of contributing artists at http://www.artspacegallery.org/ts5/. I’m in there somewhere. For further reading: The painting I exhibited at Think Small 4, in 2007. I took a fairly literal interpretation of the box theme. 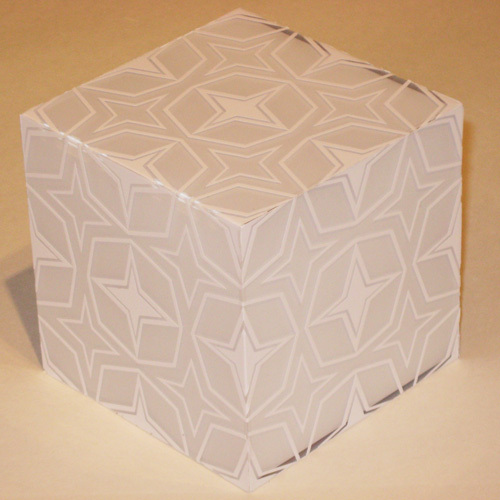 Purchased an inexpensive plastic cube, spray painted the interior with white plastic spray paint, then applied vinyl decals (a geometric star pattern I designed a while ago) to the clear front. The name I chose is “Qubiqzirq,” as in cubic zirconia. Ultimately, this was an experiment … perhaps nothing groundbreaking visually. When I finished, the piece seemed like something Jim Isermann would do. Regardless, Qubiqzirq is more like a proof of concept to see how to make something and where I might be able to take it in the future. 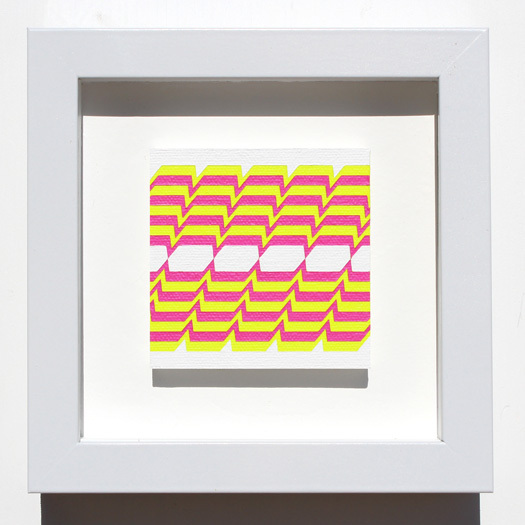 I’m very interested in making a series of “plastic paintings” — vinyl on fluorescent plexiglass. If anything, just to do something more involved than acrylic on canvas. I just finished a miniature art painting that I’ll be showing for Think Small 4, a miniature art show at art 6 gallery in Richmond, Virginia (November 2 – December 22, 2007). The guiding principle of the show is that no miniature art painting can be larger than 3 inches in any dimension. This is the second time I’ll be showing in Think Small; I participated in Think Small 3 a couple of years back. This year I’ve submitted Omnicron’s Dilemma. 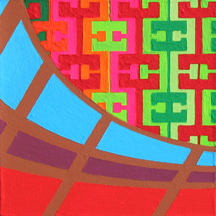 Acrylic on panel; three inches square. At left is a sketch of the miniature art painting, called Omnicron’s Dilemma, I’ll be showing in Think Small 4. At right is the actual painting, which measures three inches square. Ultimately, I think I’m going to paint a larger version of this piece, just to do the design justice. There’s lots more I’d like to write about, but I’ve got to cut this short, because I’m catching a plane to Portland tomorrow. Otherwise, I’m very much digging the new album by The Fiery Furnaces, Widow City. I think they’re making some of the most challenging music out today.